If you follow me on Instagram (and really, if not, you should be – where have you been? ), then you’ll probably know that I spent the best part of the week before last touring two amazing cities in Spain with the lovely folks from AC Hotels which is part of the Marriott Group. We stayed at two of their locations – Madrid and Valencia and alongside a bunch of other Instagrammers and bloggers from all over Europe, got to experience the sites, sounds, tastes and designs of these two incredible historic cities. It’s been a dream to visit Madrid for many years now so I’m going to share that portion of the trip with you first and then, in a couple of weeks, I’ll share my experiences in Valencia as well. 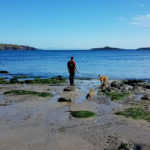 As both visits were only over a couple of days each, I thought I’d share some of my favourite spots that we visited during our stay. 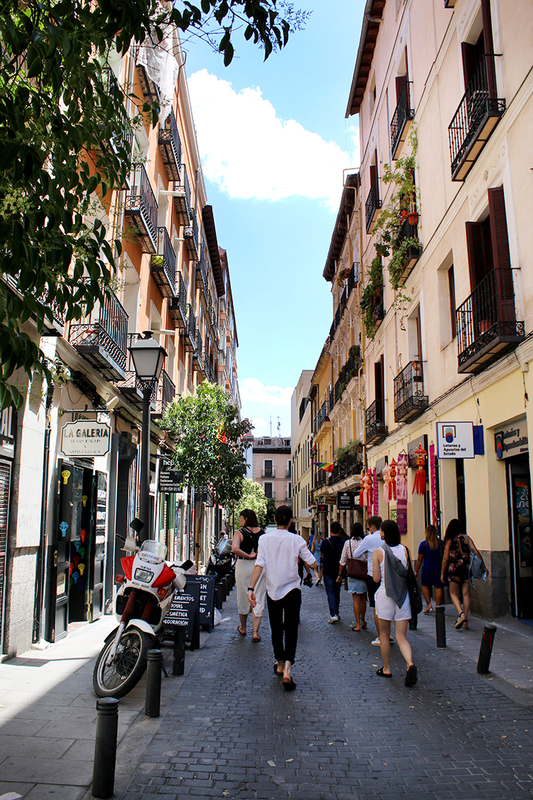 We packed quite a lot into our visits so hopefully, if you are looking to book a short trip to Madrid any time soon, you can use this post as a reference for places that would be on my own ‘must see’ list. Of course, I’ll just start by saying I was a guest of the hotel and as such, was able to spend quite a lot of time at the hotel. The AC Hotel Madrid Cuzco is only around a 15-minute taxi ride from the airport which means you’ll get off your flight and within a short time, can be sprawled out in your air-conditioned room. The rooms are simply furnished with an emphasis on clean and contemporary design with beautiful details like grasscloth wallpapers and warm, glass lighting. 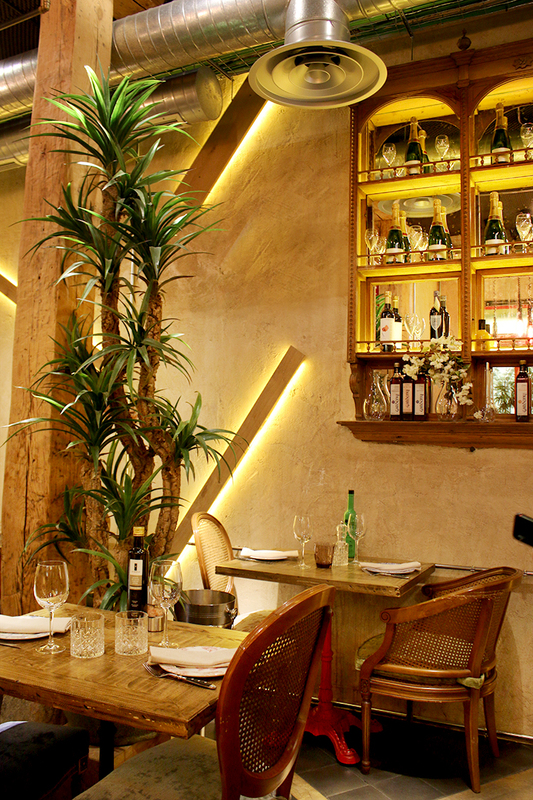 Pale wood and gold accents are used throughout, creating a calm and quiet atmosphere outside of the bustling city centre. 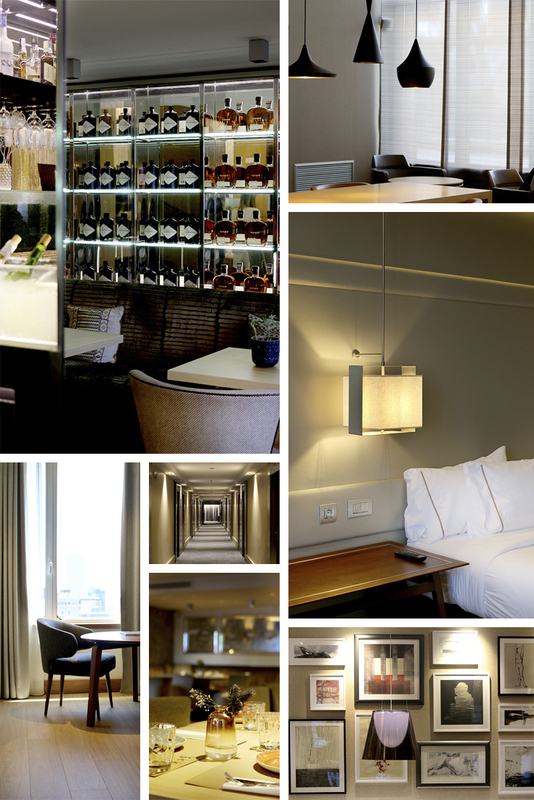 Where the hotel excels is in its common areas. There’s a fantastic lobby with a wall-to-wall gallery filled with beautiful pieces, some of which has been sourced by local artists which I loved alongside comfy sofas and places for quiet conversation. 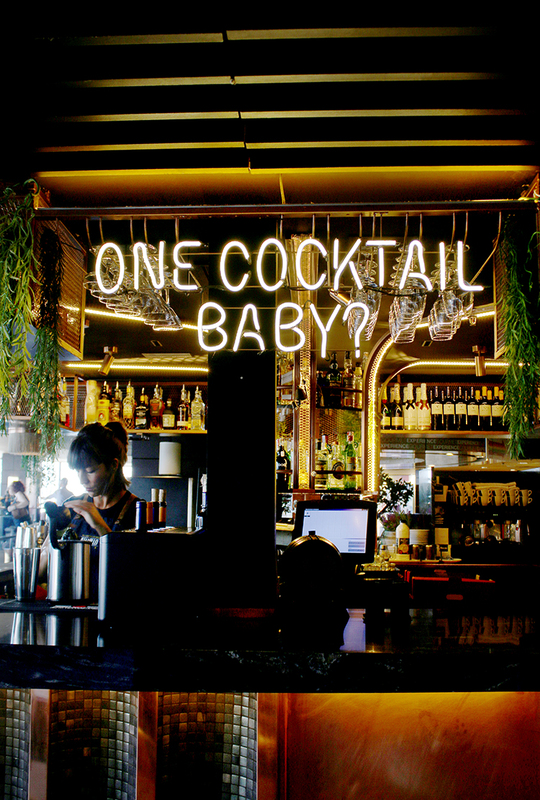 Wander over the bar area and check out the Tom Dixon lighting whilst sipping your gin cocktail, the bar’s speciality. It’s a great place to just relax and unwind before setting out into the city. 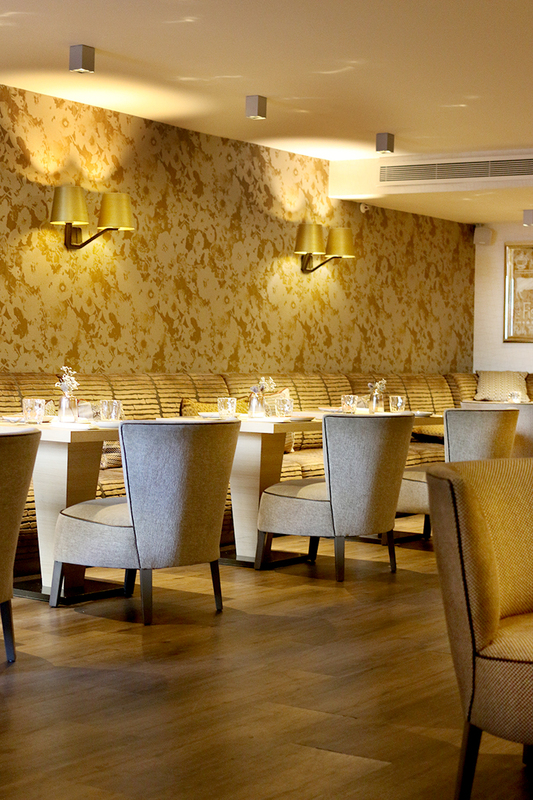 You’ll definitely want to start your day with a good breakfast and AC Hotels certainly didn’t disappoint in this regard. 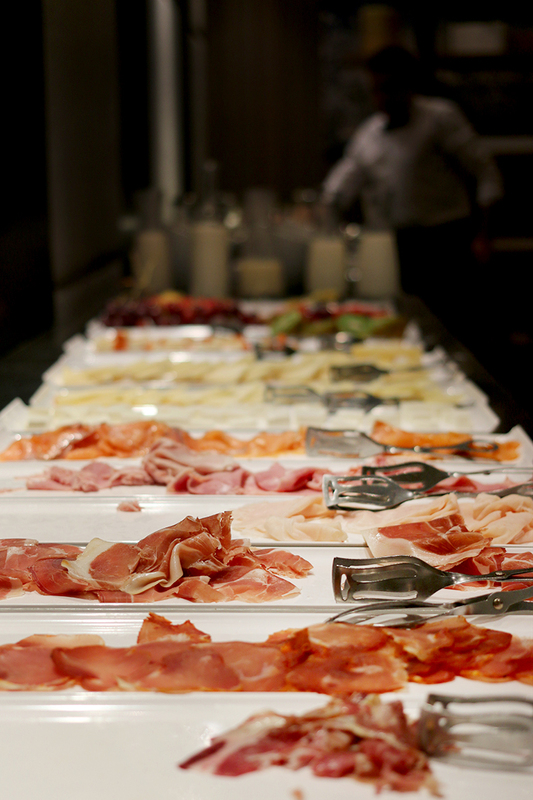 A huge selection from bacon and eggs, sliced meats and cheeses, fruit, grains, danishes and yogurt are all freshly prepared and waiting for you. A Nespresso machine makes sure you’re getting enough caffeine to get you through your city visit too! 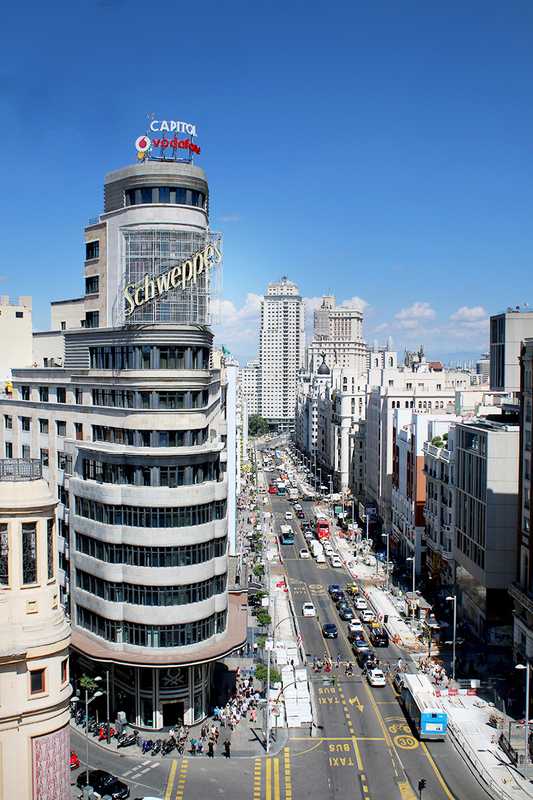 While wandering the city, head to the top floor of El Corte Inglés de Callao (The Gourmet Experience, Pl. Callao, 2, 9.º 28013 Madrid Spain). 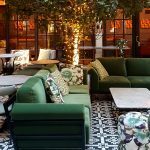 Encompassing ten different establishments including restaurants, bakeries and ice cream, you can opt to enjoy your food within the establishments themselves or relax in the communal areas of this gastronomic zone. The 1500 square foot space with incredible views overlooking the city is home to the Harina bakery; Hamburguesa Nostra, with thirty varieties of veal, beef, Iberian pork, lamb and wagyu beef; La Máquina, where you can sample traditional dishes at the bar; La Central Mexicana, serving up tequilas and other specialities of this Central American country; Imanol, serving ‘pintxos’ and cider; Amorino, with homemade ice creams; Pizza al Cuadrado; Juanillo Club, with its array of oysters and cocktails, and Mister Lee, an informal oriental dining experience. 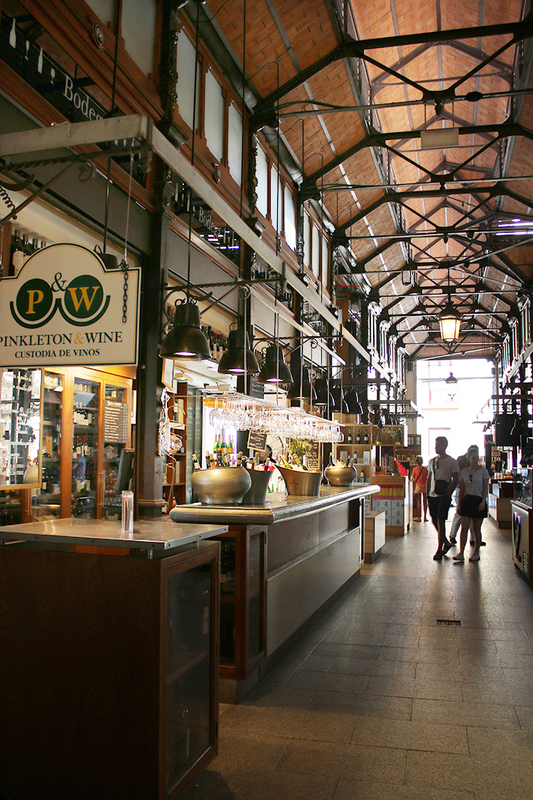 Close to the Plaza Mayor and with over 10 million visitors a year, the century-old Mercado de San Miguel (Plaza San Miguel, s/n 28005) is a must-visit. From the best Iberian ham to fresh seafood brought in daily to the special cheese from Castile, Asturias or the Basque Country, here gathers the finest foods and wine from the length and breadth of Spain over 30 different stands. If you aren’t going for the food, you’ll still want to take in the architecture with stunning carved wood, open beams and industrial style lighting throughout. 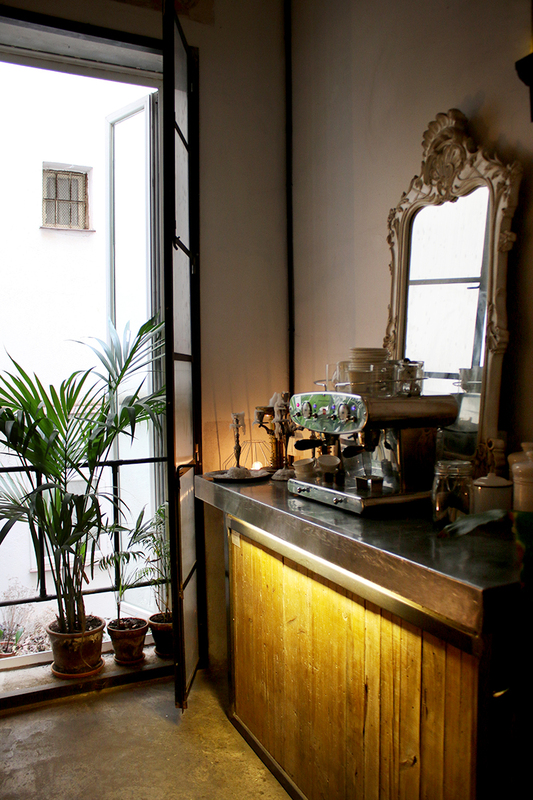 When you’re ready for a sit-down gastronomic experience, you really must check out Cuatro de Ocho (Calle San Mateo nº 21). Created by 4 brothers (out of eight – thus the name), every dish is expertly crafted with traditional and local ingredients. Don’t ask me exactly what we ate – from calamari to flavoursome salads featuring strawberries, grilled shrimp, mango, avocado and edible flowers; to something called Huevos Rotos (translated as ‘broken eggs’) and finishing off with chocolate and carrot cake, everything was incredible and so so tasty. 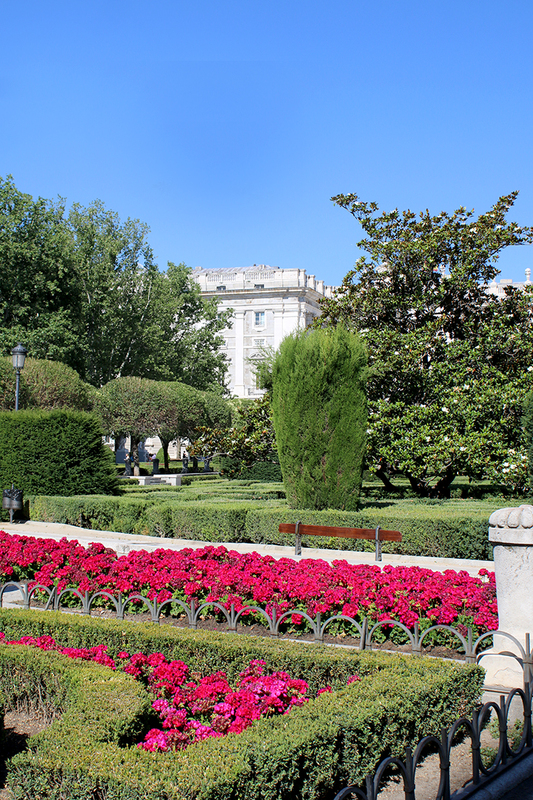 Take in the gorgeous gardens at Palacio Real de Madrid (the Royal Palace of Madrid, Plaza Mayor, 28012 Madrid) and then the sights of the palace itself. There are stone statues surrounding the estate and the castle itself – whilst no longer the main residence of the King – is where state ceremonies and official banquets take place. 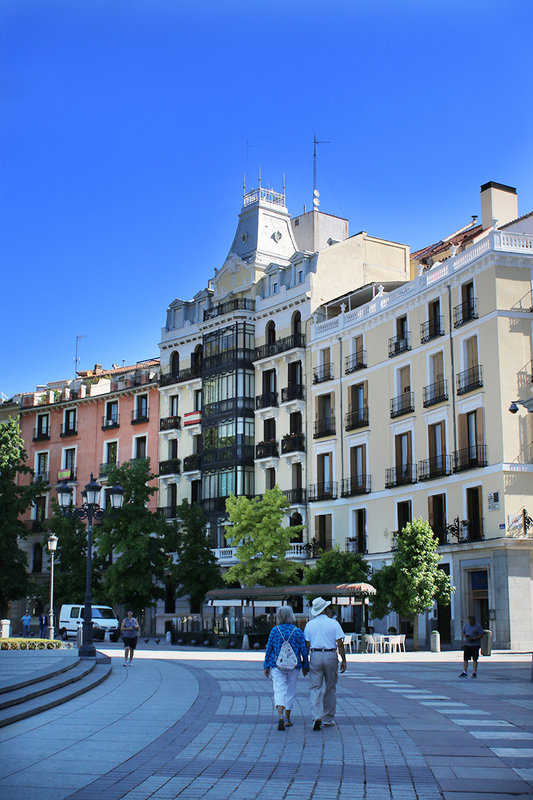 Then pop over to Plaza Mayor nearby which boasts an impressive 377 balconies. 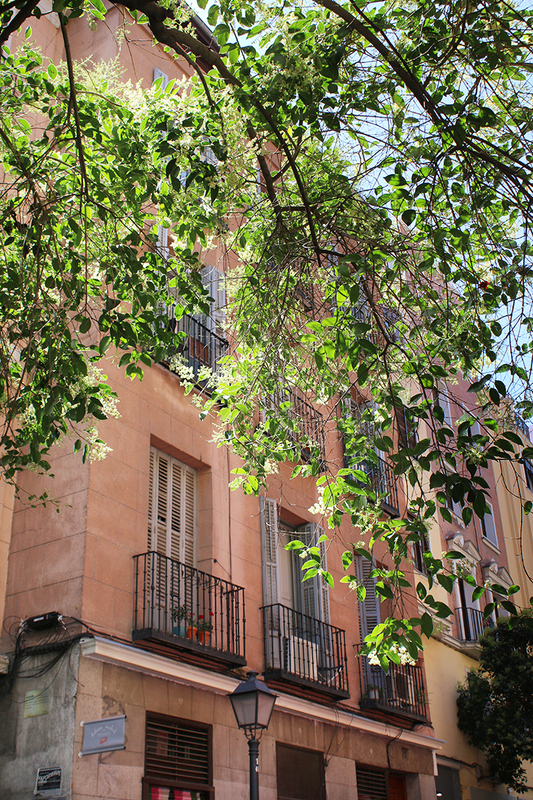 Speaking of balconies, they are simply everywhere in Madrid so don’t forget to look up even on the smaller winding streets. The city has so much beautiful architecture everywhere and there are maps sign-posted throughout the main tourist areas so you don’t have to fear too much about getting lost (and if you do, Google maps is definitely your friend!). I actually enjoyed the wandering from one tourist point to another more than the attractions themselves and you’ll happily stumble upon so many beautiful buildings so be sure to wear comfy walking shoes! 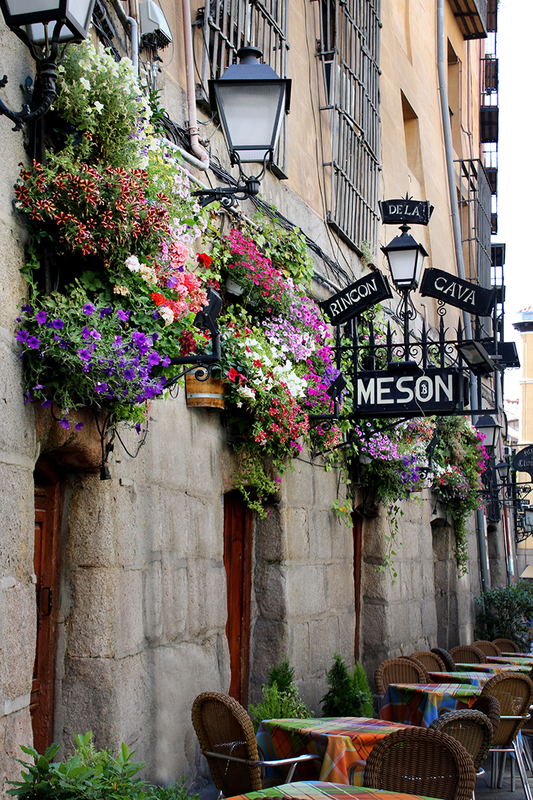 Be sure to head over to the Malasaña district in Spain. It was once a run-down crime-ridden area but in more recent years has enjoyed a resurgence thanks to artists taking residence and attracting a more creative, younger crowd. 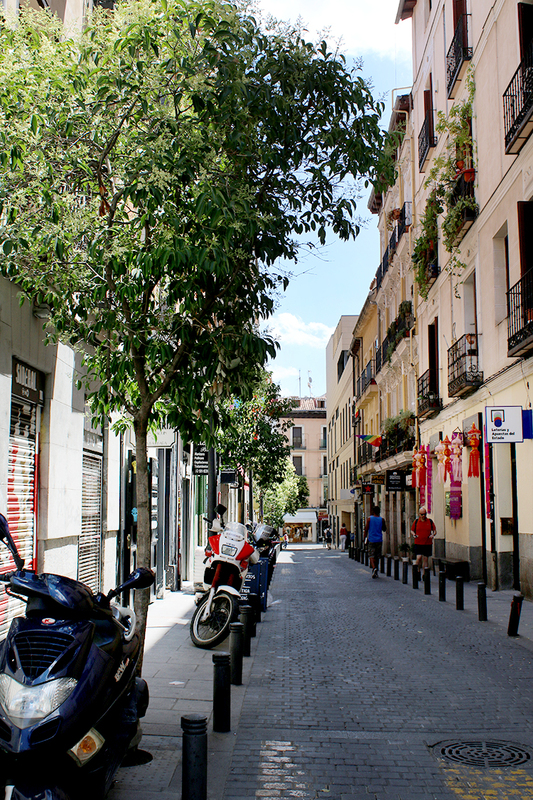 It’s essentially the Shoreditch of Madrid now, with plenty of cool bars, restaurants, galleries, shops and plenty of street art to check out. And of course, don’t forget to bring your camera! 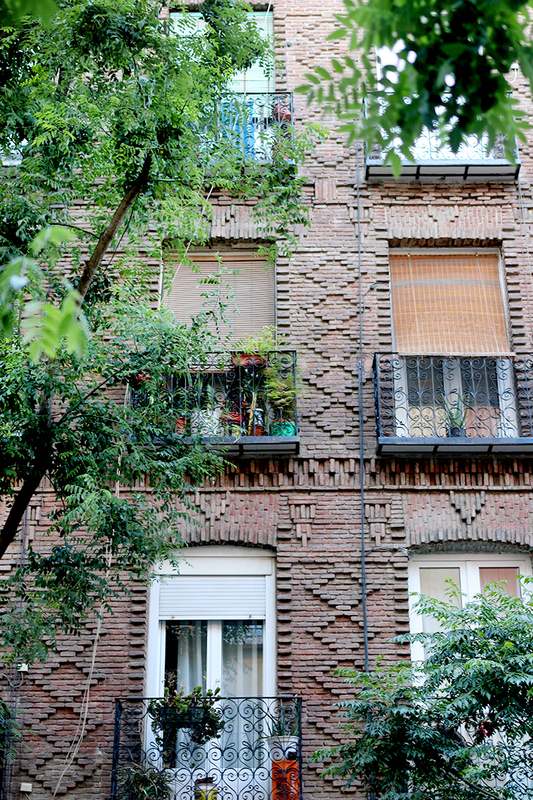 I took over 300 pictures whilst in Madrid (this is just a small selection – you’re welcome) but every street tells it’s own story and there is so much history packed into a relatively small area, you simply have to look up! There were a few cute shops that we stumbled across that I wanted to share. 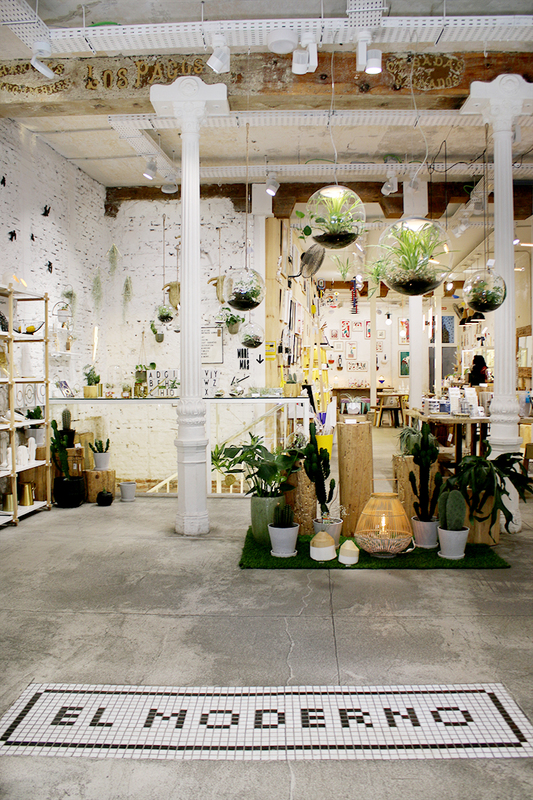 El Moderno (Calle Corredera Baja de San Pablo, 19, 28004 Madrid) is in the Malasaña area and perfect for a bit of light home interiors shopping. 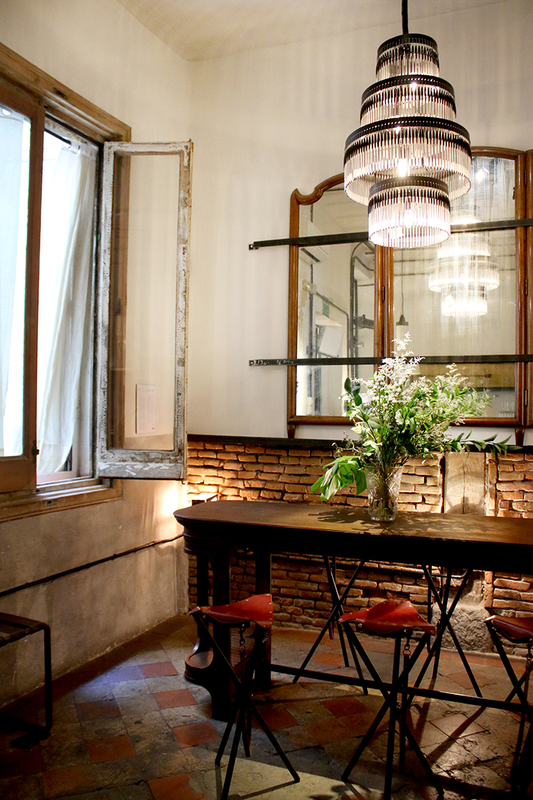 I love the way they’ve incorporated so many contemporary finds into its beautiful old architectural surroundings. 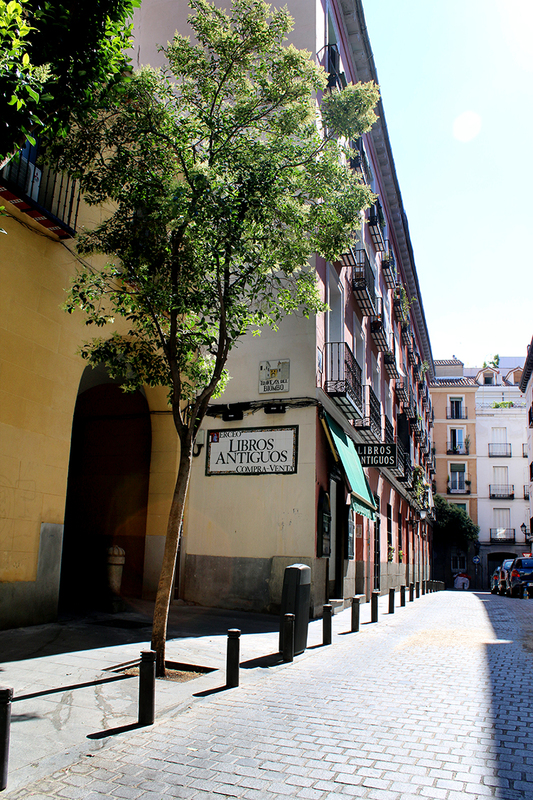 KikeKeller (Calle Corredera Baja de San Pablo, 17, 28004 Madrid) is another must see in the same area (in fact, it’s right next door!) and it’s part bar, part art exhibition, part studio and part interior design store. In the evenings, the music is turned up and the drinks flow but even wandering in during the day, you can see the place had a kind of magic. 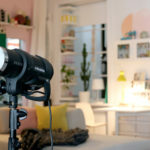 It was probably one of my most favourite places we visited for interior design inspiration. As I mentioned earlier, El Corte Inglés de Callao has amazing views from the top so even if you don’t fancy a bite to eat, then simply wander to the 9th floor to get the perfect bird’s eye view from the top. 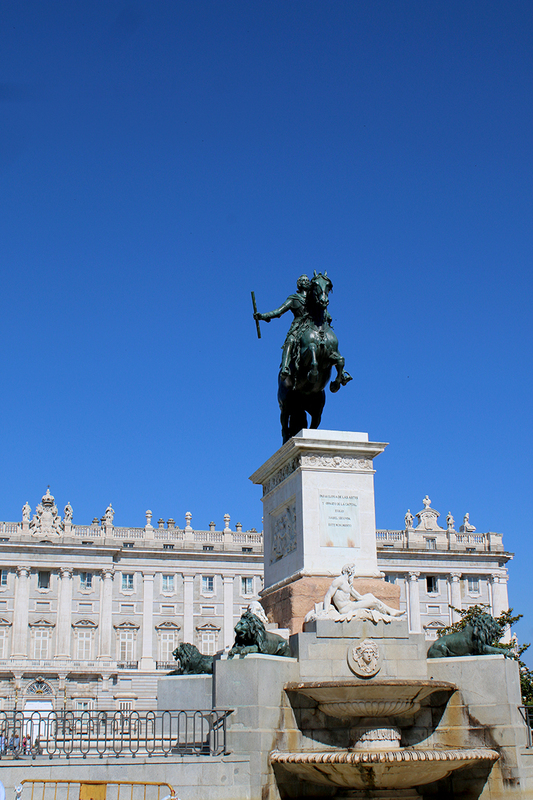 All in, it was an incredible experience visiting Madrid even if our visit was relatively short! It’s a place I’m desperate to visit again! 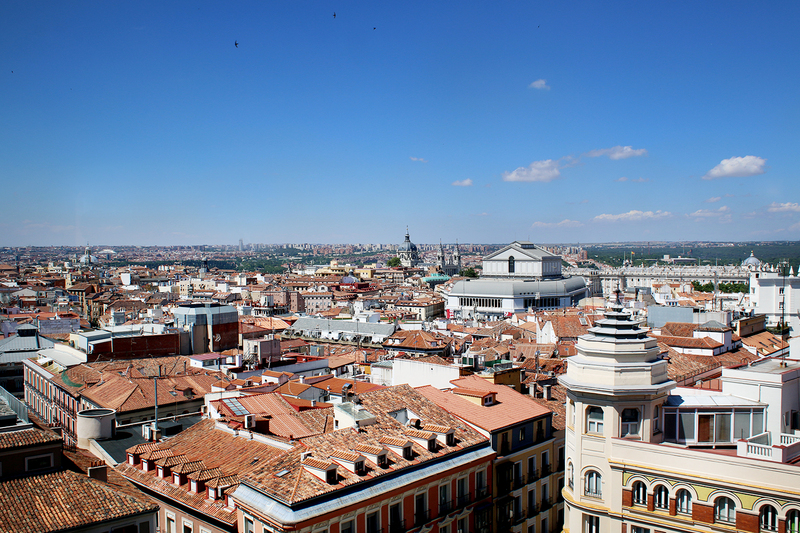 I’d love to know if you’ve been to Madrid yourself and what were your ‘must-see’ things in the city? Or is it a place on your must-visit list? Let me know in the comments! The world is a book, and those who do not travel read only one page. Madrid indeed is a fabulous city and your photos are awesome. Traveling round the world as a living can be tiresome sometimes but then it makes you modest. 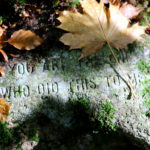 You see what a tiny place you occupy in the world.” Carry on and give us plenty of feebacks. You must go to Dubai (if you havn’t already) and visit all the ‘over the top’ furniture stores. Leave your credit card at the hotel, to resist tempation. Found the gold python I asked you about over there. Fabulous. Your pictures are great; what a lovely trip! Kimberley, your photos are amazing. I wish my holiday ones were even half as good! Not somewhere I’ve been but inspired to now. If you get the opportunity more travelogues please. I’m glad you had a great time (and enjoyed cheese from Asturias, my region)! The view from El Corte Ingles is one of my favourites. Next time, don’t miss the amazing museums. I’m also very happy that you survived Madrid in the summer. It’s like a frying pan in there!